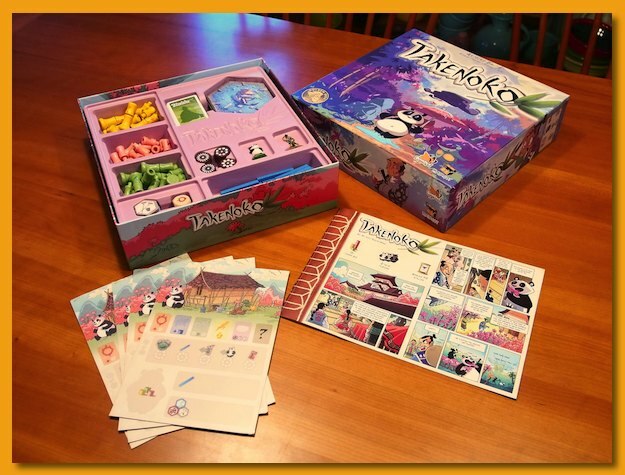 Takenoko, designed by Antoine Bauza and published in 2011, has some very cute artwork and well-crafted bits. However, beyond the great looks, there hides excellent brain massage. 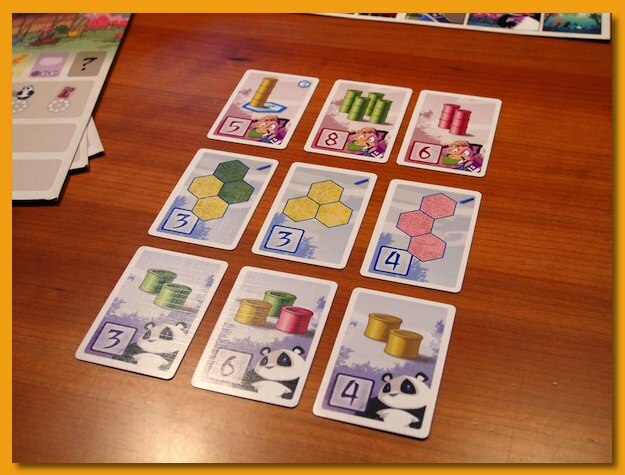 Each turn, two to four players take limited actions to lay tiles representing one of three different types of flora (pink, green, and yellow); irrigate, enrich, or protect these areas; move a gardener around to grow stalks of colored bamboo; or move a panda around to eat segments of the grown bamboo. Different actions earn points and by game end, the player with the most points wins. The game comes with a stack of brightly colored hexagonal tiles representing the terrain types in three colors. Three types of cards represent the various goals the player is trying to meet to earn points. The game also comes with wooden bamboo segments that are stacked to represent the growing bamboo, blue wooden irrigation channels, as well as small hexagonal terrain enrichment tiles that modify the result of other actions on that tile. 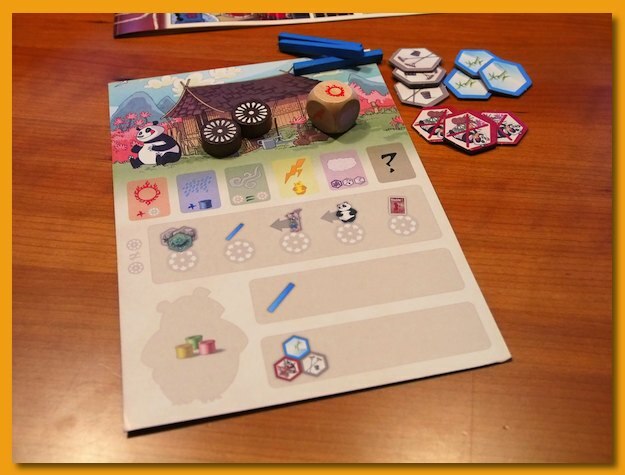 A player card describes the actions a player may take, small markers for each player to mark the actions they wish to perform, a wooden die, and two nicely crafted sculpts representing the farmer and the panda. During the game, players obtain goal cards in three flavors and attempt to meet those goals to score points. One type of card depicts a pattern of bamboo growth that must be depicted on the board in some area during a players turn (e.g. four green bamboo shoots of height exactly three). By moving the farmer, players attempt to grow bamboo to meet these goals. Another type of card represents a pattern of tile orientation on the ever-growing board. As players place tiles, they attempt to create these pattern and irrigate those tiles (so that bamboo will grow) to meet these goal cards. And finally, the third type of card represents the bamboo segments that must be obtained by moving the ravenous panda around the board who eats segments of the growing bamboo. Once you collect segments of the appropriate colors, you can turn them in for the points depicted on the card. Move the farmer (he can move in a straight line in any of the six directions from the tile he’s currently on and may stop anywhere). When he stops on an irrigated tile, bamboo grows there as well as on any adjacent tile of the same color. Move the panda (he also moves in a straight line like the farmer and he can stop anywhere along the line). If he stops on a tile that contains bamboo (and he’s not prevented from eating it by the “no eating!” enrichment tile) he eats one segment. Take a single card from one of the three available types. You’re never allowed to have more than five cards in your hand. At any point during your turn you can lay one or more irrigation sticks or enrichment tiles in conjunction with your normal actions. The game ends when a number of goal cards has been met by one of the players (differs depending on the number of players) and once met, the remaining players take one more turn and the player with the most points wins. The player that triggers the end game is granted a 2-point bonus. 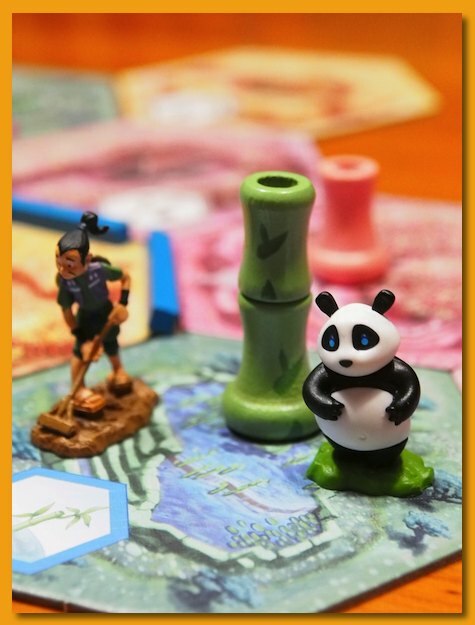 Takenoko is a simple game of tactics. It’s easy to learn and quick to play. It’s not a strategic masterpiece of brain-burning goodness and it won’t represent the prized game in your collection but it is great for a short, light game for a small group to begin or end the night. With such nice bits it’s hard to not like it, at least a little bit.